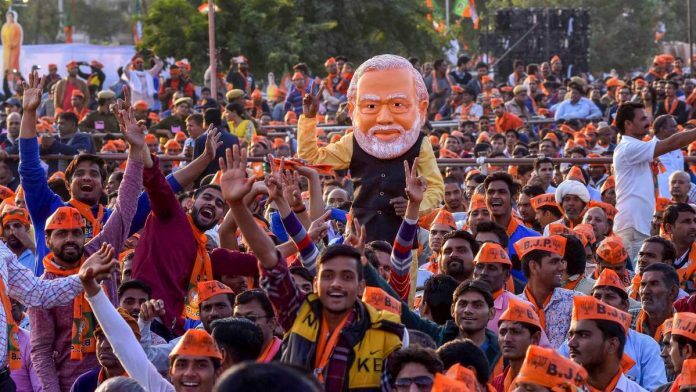 It’s the final day of campaigning in Rajasthan and Prime Minister Narendra Modi is still busy holding rallies — with two scheduled Wednesday, ending with one in Dausa. This is unlike his approach in Madhya Pradesh and Chhattisgarh, the other two states where the Bharatiya Janata Party (BJP) is fighting anti-incumbency. In these states, Modi left it to the state leadership to lead the charge towards the end of the campaign. His last day push in Rajasthan is reminiscent of some other recent elections in Uttar Pradesh, Gujarat and Tripura, where the PM held rallies towards the very fag end of the campaign. Many in the BJP see it as part of a calibrated pattern. In states where he moulds the election around himself, Modi chooses to campaign till the very end. In UP and Tripura, for instance, there was no local face and the PM was the pivot. In Gujarat, chief minister Vijay Rupani was secondary given his limited appeal. In Rajasthan, Vasundhara Raje’s massive unpopularity has meant Modi has tried to be the more dominant face. In Madhya Pradesh and Chhattisgarh, however, the incumbent CMs — Shivraj Singh Chouhan and Raman Singh — remain reasonably popular and have a mass connect. BJP leaders interpret Modi’s approach of allowing them to be at the forefront and close the campaign as an expression of his faith in them. She may not be aware of it, but Rajasthan chief minister Vasundhara Raje has got her own PK, or political strategist Prashant Kishor, in K.K. Sharma, co-convenor of BJP’s media cell at the party headquarters in New Delhi. Or so it seems. Sharma claims — to any journalist who cares to hear — to have brought a turnaround in the BJP’s fortune. According to Sharma, Raje was on the backfoot until recently and so he launched a media blitzkrieg, getting union ministers to visit every district headquarters to address the media. “Congress leaders have been left speechless now. The party is now cruising to victory in Rajasthan. Please don’t give me credit for it if you write,” a humble Sharma has been telling journalists in the national capital. As things are, if Raje loses, she will have to take the entire blame. But if she wins, there will be many claimants for the victory, including Sharma. The allegations of electronic voting machines (EVM) tampering by the opposition has sent BJP leaders on the offensive. Rashtriya Swayamsevak Sangh (RSS) media in-charge in Delhi, Rajiv Tuli, in his excitement to counter the allegations, posted on Twitter a picture of a woman wearing a Congress band and pressing the button for BJP candidate Gyatari Raje Puar, wife of Tukoji Rao Pawar, scion of erstwhile Puar dynasty in Madhya Pradesh. He captioned the picture as “fir kahoge EVM kharab hai (Then you will say EVM is faulty)”. Tuli’s post has resulted in many questioning him over rules. Taking pictures while casting votes isn’t allowed. After his refusal to travel to Kartarpur Sahib across the border into Pakistan, where the holy Sikh shrine is located, Punjab chief minister Capt. Amarinder Singh is believed to have called the Speaker of Pakistan’s Punjab provincial assembly Chaudhary Pervaiz Elahi and apologised to him over the phone. “I would have liked to come to Pakistan, I hope you understand why I couldn’t,” he is believed to have told Elahi. Singh didn’t go to Pakistan although he was invited to the ground-breaking ceremony by Pakistani Prime Minister Imran Khan. Singh’s reason was that it isn’t possible to demonstrate both love and friendship on the one hand and suffer the consequences of cross-border terrorism from Pakistan. Ironically, the Kartarpur Sahib shrine, where Guru Nanak breathed his last, was built by Amarinder’s grandfather, then Maharaja of Patiala Bhupinder Singh. President Ram Nath Kovind is visiting Myanmar later this month. While such state visits don’t attract too much scrutiny, all eyes will be on the planned meeting between Kovind and Myanmar Counsellor Aung San Sui Kyi. With Sui Kyi’s studied silence over atrocities on the Rohingya Muslims turning into a major talking point worldwide, it would be interesting to see what the two leaders talk about. The issue of continued violence against the Rohingyas in Myanmar and their influx into India are big issues right now. That Punjab chief minister Capt. Amarinder Singh considers his cabinet colleague Navjot Singh Sidhu an upstart, one who is always looking to grab headlines and has an eye on the CM job, is the worst kept secret in Punjab. However, equally well known is that there is no love lost between Singh and Congress Rajya Sabha MP Partap Singh Bajwa. When Bajwa was Punjab Congress chief, Singh’s loyalists made life difficult for him. Now with Singh under pressure from Sidhu, Bajwa seems to have decided to add to his woes. On Tuesday, Bajwa held a press conference to announce support for sugarcane farmers, protesting against Singh’s government. A few days ago, Bajwa had also sided with Sidhu after the latter came under attack from the BJP for going to Pakistan for the Kartarpur Sahib event. He had asked the union government to explain who allowed Sidhu to travel to Pakistan. As the saying goes: Enemy’s enemy is a friend. On the last day of the controversial Sohrabuddin Sheikh and Tulsiram Prajapati alleged fake encounter case, Justice S.J. Sharma, the Mumbai trial court judge hearing the case, turned a tad emotional. He thanked the prosecution, the defence lawyers, the accused, witnesses as well as members of the media reporting the trial for the cooperation. He said that it was great that everyone could spare time to come to the courtroom despite Mumbai being such a busy city. He saved special praise for advocate Gautam Tiwari, who was representing Sohrabuddin’s brother Rubabuddin Sheikh. The judge spoke about how Tiwari knew the case inside out and made some of the clearest and best arguments.